“If you think health care is expensive now, wait until you see what it costs when it’s free.” That quip from satirist P.J. O’Rourke is more than just a funny twist on words, it provides a window into the future of health care, Barack Obama style. President Obama believes that government is the solution to every problem. He portrays our health care system as wildly unfair and charges that medical costs present "one of the greatest threats not just to the well-being of our families ... but to the very foundation of our economy … We cannot delay this discussion any longer," Mr. Obama said. But it is not just a discussion that Mr. Obama wants; he wants a comprehensive overhaul of US health care and by tying the health care system to the economy, he plays on economic uncertainties to strengthen his argument for reform. Americans who want improvements in the system are scared into supporting his radical plan. He is following Chief of Staff Rahm Emanuel’s dictum, “never let a serious crisis go to waste.” And if the crisis isn’t serious enough, you can always make it seem worse than it is. Mr. Obama cites the number of bankruptcies caused by medical costs to bolster the argument in favor of nationalized health care. "The cost of health care now causes a bankruptcy in America every 30 seconds,” says he. Sorry, Mr. President, that has been shown to be false. The numbers simply don’t add up, and the way personal bankruptcies are defined further skews the numbers. A larger factor than high health care costs is people spending beyond their means. Hardly anyone will argue that health care costs are not too high. But that fact alone does not justify nationalizing the system, duplicating the horrors that exist in other countries where health care is run by government. It is significant that Mr. Obama feels the need to exaggerate the situation in order to get people to support his radical idea for a government-run health care system. And if you don’t believe that is the ultimate goal, you are deluding yourself. The President recently extracted agreement from health care insurers and providers to cut $2 trillion in costs over the next ten years, and Congress is trying to cut Medicare fees by 21 percent. Medicare saves money by paying doctors and hospitals less, and currently pays only about 50 percent of charges from hospitals. Further cuts in reimbursements will make it more difficult for hospitals to survive, will discourage people from entering or staying in the medical profession, and will create provider shortages. That is what happened in places like Great Britain and Canada, where long wait times – often months or even years — to see primary care givers and specialists, and for medical procedures are common. In Canada, the best drugs to treat cancer and other illnesses are victims of expense cutting, and efforts to hold costs down by purchasing fewer medical devices like MRI scanners and CT scanners are also common. The Organization for Economic Co-operation and Development reports that CT scanners per million people were 7.5 in Great Britain, 11.2 in Canada, and 32.2 in the US. MRIs were 5.4 per million in Great Britain, 5.5 in Canada, and 26.6 in the US. 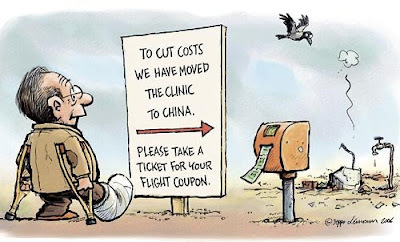 If the cost of medical care is the pivotal factor, then cost cutting is the answer, and that inevitably means rationing care. We can already see this in the way Medicare reimbursements are designed and modified. The president seems to have dreamed up this solution without answering the most important question: why are health care costs so high? That’s one question for which “government” really is the correct answer. Politicians often impose little government fixes for things that are imperfect in the private sector, and since nothing is perfect there is ample opportunity for government mischief. These fixes generally make things worse, so the politicians impose additional government fixes, which make things worse yet, and then they are forced to rush in to save the day with a broadly intrusive and expensive government solution. Think: Amtrak, the US Postal Service and Medicare, financial failures all, subsidized by taxpayers. One such effort at fixing the health care system is the U.S. Senate’s, “Expanding Health Care Coverage: Proposals to Provide Affordable Coverage to All Americans.” The description of policy options says, “Today, the cost of caring for the uninsured is largely borne by those with insurance; providers charge higher prices to patients with private coverage to make up for uncompensated care, and these costs are passed on to consumers in the form of increased premiums.” Funny, it doesn’t mention the “under-compensated” care of Medicare patients. A good health care system has to work not only for those who receive care, but also for those who provide it and those who pay for it. We are too often willing to impose a radical new system to replace one that with just a little tweaking would be perfectly adequate. That is the situation we face today. The Obama administration is rushing a massive, expensive government program through the Congress that will hurt taxpayers. The 95 percent of us who were promised a tax cut can kiss it goodbye.